It seems like more growers and consumers are demanding flavorful, organically grown, as well as healthy and beautiful vegetables. Plate appeal is paramount with fine restaurants, but increasingly, home growers are finding that this attribute is just as important as nutrient value and ease of growing. Perusing the seed catalogs this winter, I came across Wild Boar Farms, whose mantra is “changing the world one tomato at a time”. Owned by Brad Gates, Wild Boar Farms is located in Napa Valley, St. Helena, California. Gates is passionate about tomato growing and to listen to him talk about them, it almost sounds like a vintner discussing relative merits of different wines. Watch him explain how he grows his tomatoes. Gates has grown tomatoes in California for at least a dozen years, and started his love affair with tomatoes when he worked at a farmers market for a friend. That experience showed him what people were looking for in a tomato. 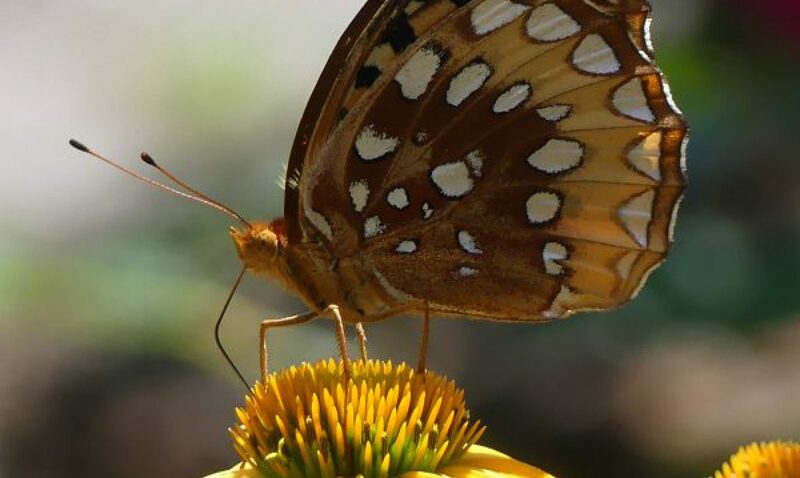 Reading the descriptions of his tomato varieties, you see phrases like – port wine color with metallic silver green stripes (Pink Boar), or a hint of tropical fruit (AAA Sweet Solano), warning, high acid content may cause flashbacks! 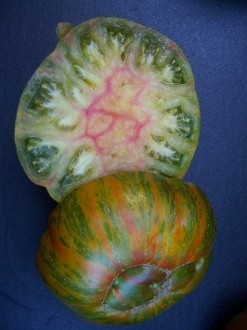 (Berkeley Tie Dye), and dark, earth tones of rich tomato (Black and Brown Boar). Sounds like a wine tasting description, doesn’t it? Maybe growing these tomatoes in the wine country of Napa Valley has something to do with the similarities to wine making jargon! Wild Boar Farms claims to offer some of the “most outrageous tomato varieties on the planet”. 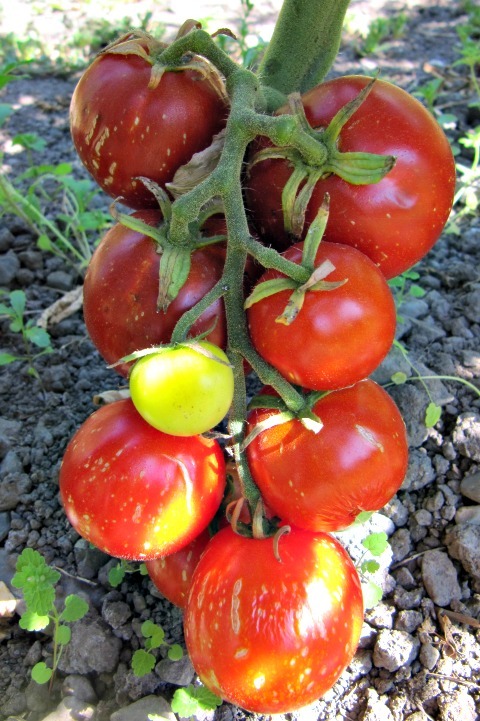 On the cutting edge of developing new tomato varieties using heirloom genetics and mutations as a foundation, Gates then improves on that to produce some remarkable tomatoes. 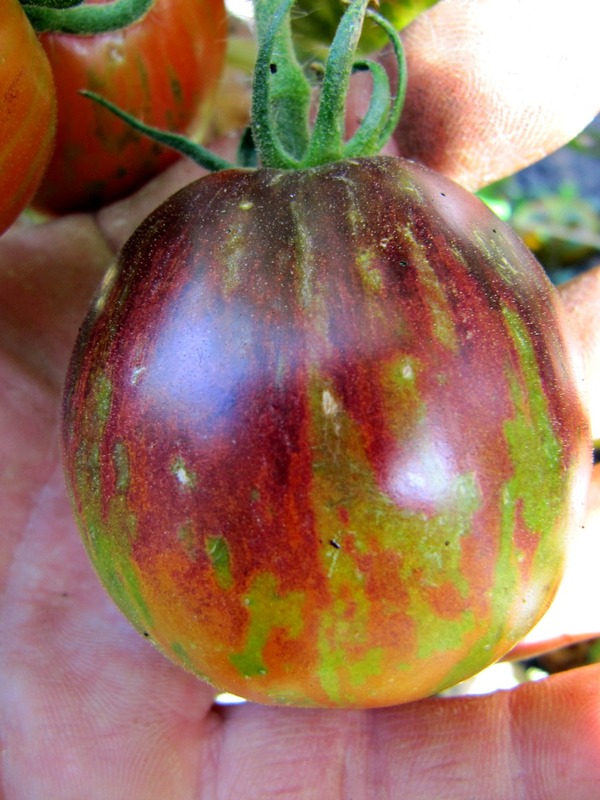 The parentage of many of his new varieties are Zebra tomatoes and his focus is on bi-color and striped varieties – not your grandma’s tomatoes!! Since Gates specializes in growing thousands of tomatoes every season, he has some good pointers for improving your harvest. The way he describes taking care of his plants is kind of like how a parent takes care of his children. He says be “nice” early on before they set fruit, caring for them with lots of compost, and plenty of water. Later when the tomatoes set fruit, let up on the watering as heirlooms have a thin delicate skin, which with too much rain or water can crack. Kind of like children, nurture them when young, and then set them free! As to appearances and flavor, Gates likes to have three to four colors at a single sitting for the most flavor. Each expressed color produces different vitamins and minerals that add to the total tomato package. Light ones like yellows and oranges, he describes as tropical or fruity, dark ones as earthy notes. 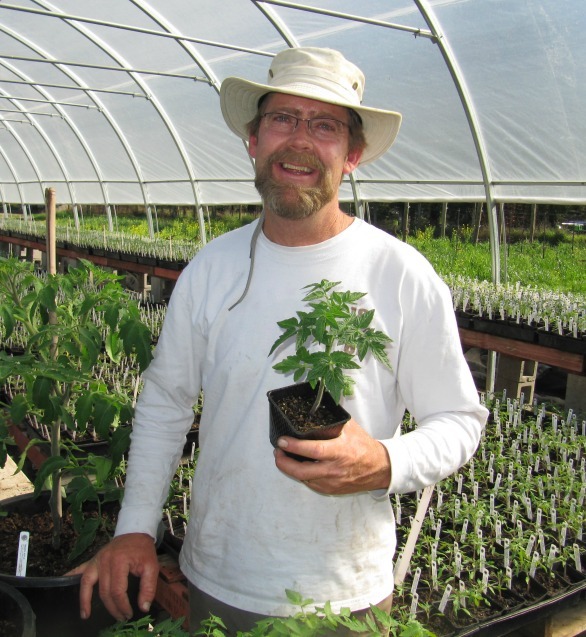 There is an annual National Heirloom Expo held in Santa Rosa California every September, sponsored by Baker Creek Heirloom Seed, and Brad Gates showcases his tomato varieties there. This festival is on my bucket list to visit. Baker Creek carries Gates’s heirloom seeds and I ordered a couple to try this year. Go to my post Art of the Seed to get more information about this company. Anthocyanin is also the blue pigment found in blueberries, purported to have many healthy benefits. Indigo Apple is supposed to be an improvement on Indigo Rose in the taste department, and I can attest that it is a tasty tomato – more like a sweet Early Girl instead of a large Beefsteak. Indigo Apple is a cross between Indigo Rose and a cherry tomato and is very resistant to sunscald with that black coloration. I noticed that it lasts a long time on my counter. When other tomatoes are rotting and splitting, Indigo Apple stays firm. 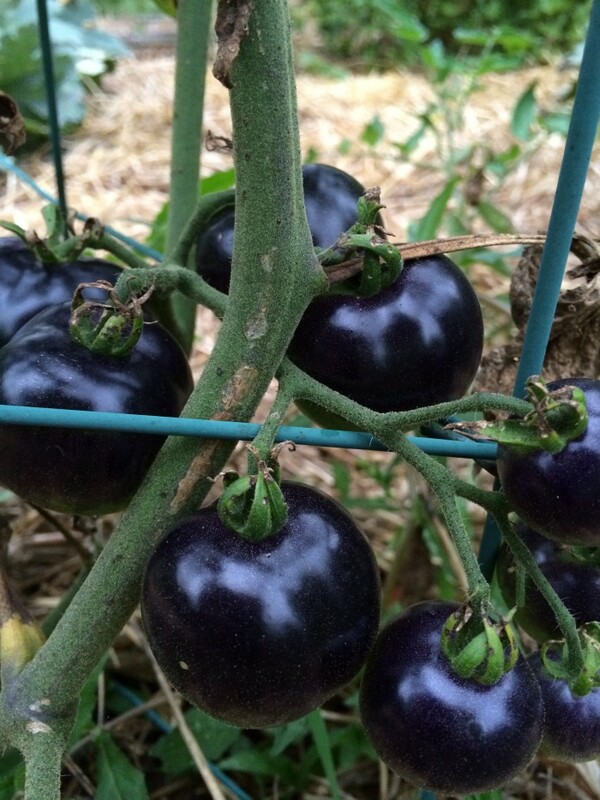 As to nutrient content, the blue-black or darker tomatoes beat out all other varieties. 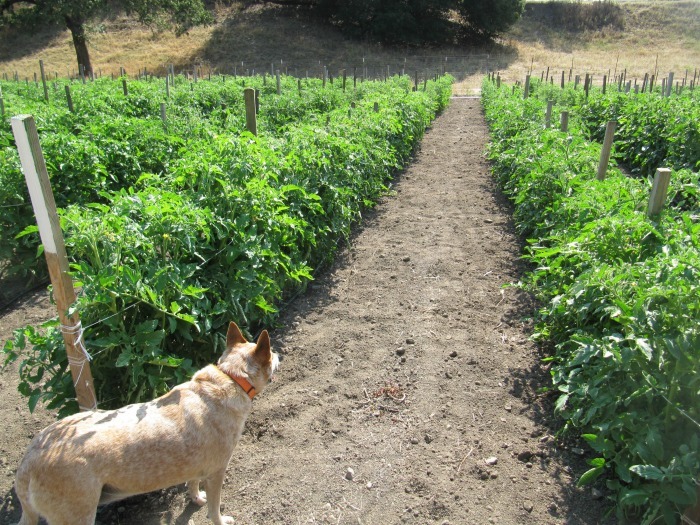 Go to http://www.wildboarfarms.com/downloads/2013-Tomato-Nutrition.pdf to see the rundown of tomato nutrients. 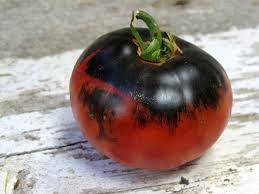 I am trying Black Krim, which is a Russian Heirloom, and Indigo Apple which tops the charts with high levels of lycopene. You can order tomato seeds directly from Wild Boar Farms also. “Darker tomatoes have more lycopene” is not really a correct statement. One could say of the BC assessment “in these samples the darker ones tended too” but there are documented higher lycopene amounts in other lines that are not “dark” (nor are they heirloom). In addition to variety and how the plants are grown: how the fruit are sampled and tested influence the readings one will get. Most testing labs simply sample 100g of crushed fruit from (hopefully) a random sample. The majority of lycopene is found in the pericarp (fleshy part) and only small amounts found in the locules. So when a 100g sample of a fruit that is mostly flesh is compared to a 100g sample of a fruit that is mostly locular gel – the sample will already be biased (apples to oranges). 100g of pericarp from several fruits of variety A should be compared to 100g of pericarp from several fruits of variety B for a more accurate assessment (and technically those should be replicated and averaged). This way the same amount of lycopene containing material (100g of pericarp) is compared between varieties for a more accurate assessment for what their lycopene potential is (apples to apples). Of the mutations that increase lycopene levels, or any other pigments for that matter, I would say it’s the intensity or richness of pigment color rather than the just “darkness” of fruit that indicates higher levels. 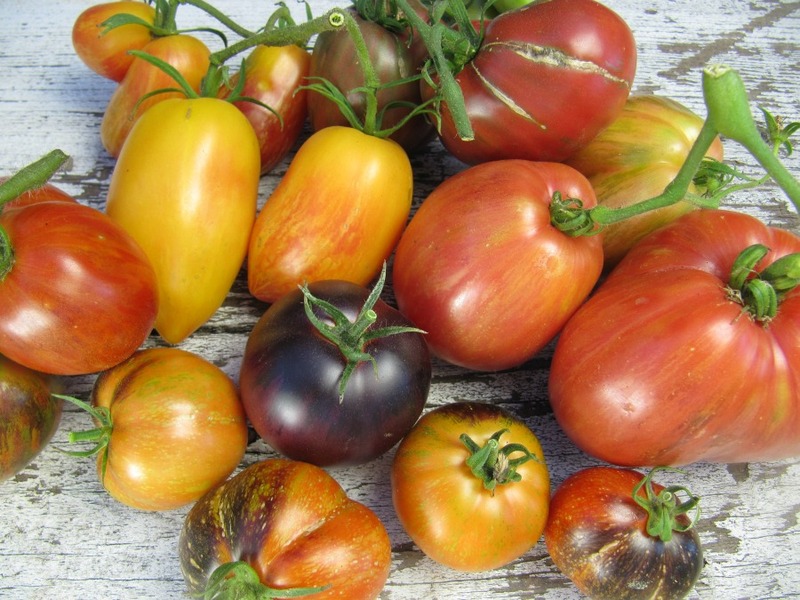 Love the colorful varieties – so much more fun than boring hothouse tomatoes. Since I eat so few tomatoes due to a bit of sensitivity, high flavor counts. And while I’m always interesting in nutrition – what’s the point of eating empty calories – I also want to know that I’ll enjoy what I’m eating. Thanks for sharing what’s new for this fruit! Last year I grew Yellow Brandywine and am trying Mortgage Lifers this year. Too bad they don’t have cool stripes!